i’ve been dying to try it, and last weekend it finally happened. 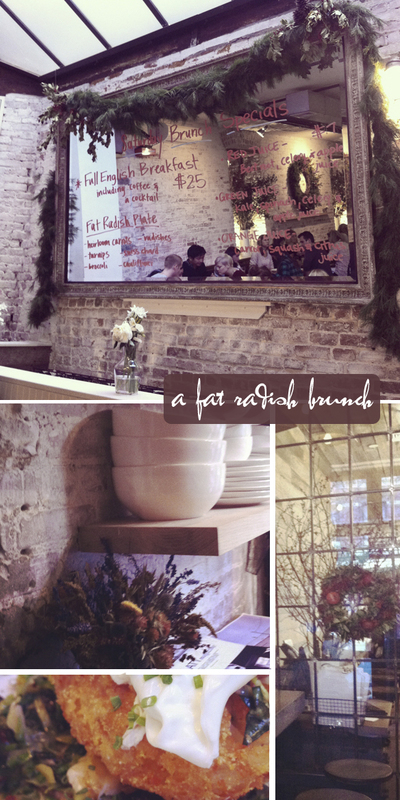 brunch at the fat radish. i’ve been obsessed ever since eating a rhubarb trifle from their table at the hester street fair earlier this summer. it was so good. as i shoveled that trifle into my mouth some man took my picture. he said he worked for the NY Times and could i sign this release form? they were working on a story about how popular street fairs and flea markets have become. duh. they didn’t use the photo for the article. (i must have been chewing with my mouth open!) still worth reading, though. back to brunch. potato and cheddar cake over sauteed brussel sprouts with a little bacon and a perfectly poached egg. spiced poached pears with a little homemade ricotta cheese. perfect meal… beautiful space with whitewashed brick walls and gorgeous, sophisticated holiday decorations. love.